This homemade mouthwash recipe is super easy to make and all-natural. You will know exactly what is in your mouthwash and be sure there are no added chemicals, alcohol or toxins. It is safe for the whole family to use even the little ones and you will save some money making your own mouthwash. The essential oils used have anti-bacterial properties to kill germs naturally and will help freshen your breath and prevent gingivitis (periodontal disease) and gum disease to boot! Some people have reported it also helps to heal and soothe canker sores. 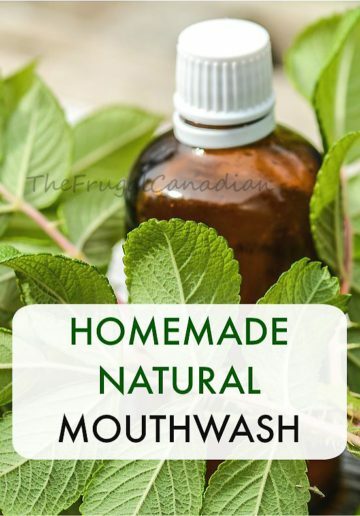 This Peppermint Homemade Mouthwash Recipe does not contain hydrogen peroxide. Store your mouthwash in a sealed jar or container. Take a sip of your mixed peppermint homemade mouthwash, gargle and swish for about 20 seconds or more. Don’t forget to shake it well before each use!